With the iPhone 5 launch in the rear view mirror, numerous analysts have chimed in with their Q4 and full year iPhone sales estimates. Unfortunately, a lot of these estimates seem quite unrealistic given the market realities I talked about in my last post. Let's take a deeper look at iPhone sales patterns and see if we can come to a more reasonable estimate. As I mentioned in my previous post, I expect the iPhone 5 to drive a blowout Q4 for Apple. Most analyst estimates for Q4 iPhone sales seem to be hovering around the 50 million mark. While I think we'll have a better idea of that number when Q3 results are announced, that seems to be a fairly reasonable estimate. However, quite a few analysts have also predicted roughly 250 million total iPhone sales over the next four quarters and that's where the problem lies. The chart above is based on Gartner's quarterly smartphone data, as it tracks sales to end consumers and not shipments. The sales pattern is slightly more normalized as compared to the shipment pattern, i.e. sales seem to be slightly more spread out than shipments are. However, the basic pattern seen across successive iPhone launches is the same. With each successive launch, more demand seems to be focused on the launch quarter and there is a significant decline in demand in successive quarters. 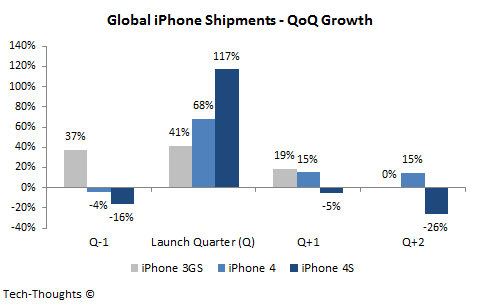 Also, there seems to be a large drop between QoQ Growth in following quarters for the iPhone 3GS/4 vs. the iPhone 4S. 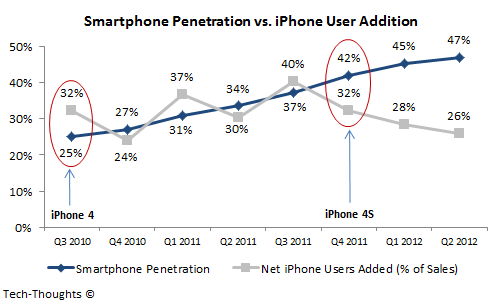 Smartphone penetration & absolute net iPhone user addition figures have been reported by Comscore. US iPhone sales have been estimated based on Gartner's smartphone data and the assumption that Apple's region-wise revenue split approximately reflects the iPhone's region-wise sales split. Based on this, any errors would be evenly spread across all data points and will not affect the pattern itself. The chart above shows that the proportion of net iPhone users added have seen a sharp decline as smartphone penetration has exceeded 35%. Since the percentage of "iPhone users added" peaked before the launch of the iPhone 4S, it is unlikely to have been caused by the product launch. Therefore, the most likely cause of the QoQ growth patterns in the charts above is that a rising proportion of iPhone sales have come from existing iPhone owners upgrading their devices and fewer customer acquisitions. Since this pattern would affect all smartphone players in the US market, it is unlikely to affect market share, but it would have a major impact on absolute sales & growth figures. It is important to note that this pattern would not only affect the US market, but all developed markets with high smartphone penetration, including large European markets and Japan. The only other trigger for a sharp jump in iPhone sales would be a deal with China Mobile over the next year. However, based on compatibility issues and other issues in China, such a deal seems unlikely in the near future. Assuming the post-iPhone 5 launch QoQ growth rates to be the same as that for the iPhone 4S and a 50 million Q4 sales estimate, the full year sales estimate comes out to about 170 million. However, if we take into account the trend of declining post launch QoQ growth, we get an estimate of 150 million. Based on the available data, 150-170 million seems to be the most realistic estimate for iPhone sales over the next four quarters, far below the 250 million figure that some analysts seem to be banking on. 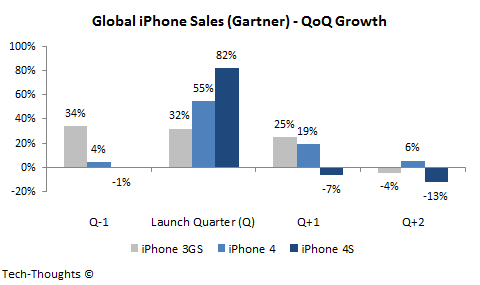 Conclusion - QoQ growth patterns of recent iPhone launches and the impact of rising smartphone penetration show that analyst estimates for full year iPhone sales are quite unrealistic. Based on the figures above and a 50 million estimate for total Q4 iPhone sales, 150-170 million is a far more realistic estimate and still quite impressive. Great analysis... One quick question...150 million is all iPhones put together or only iPhone5? This is for all iPhones put together. Unfortunately, reliable sales/shipment figures for specific iPhone models are hard to come by. 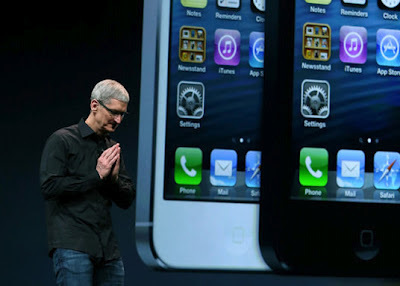 Thanks... What is your best guess on % of iPhone5 sales out of those 150m to 170m ? Tough to estimate, but I would assume at least 50-60%. Could be more. Hi Sameer - Once again an astute post. "Therefore, the most likely cause of the QoQ growth patterns in the charts above is that a rising proportion of iPhone sales have come from existing iPhone owners upgrading their devices and fewer customer acquisitions. " I would just like t point out that once we reach a certain level of adoption, what you point out here is not only natural but inevitable. As the previous owner group grows, by definition it becomes - at some point in time - a larger and larger proportion of the purchasing population (assuming the population is finite :P ). This is both a disturbing thought and a huge benefit. With such extremely high satisfaction ratings, Apple is keeping most of its customers. They will then upgrade (my guess is avg ~= 1.4 years) so they form a base upon which new customers are added. It is just the mix that looks like it is negative. However, a sale is a sale and this upgrade cycle still contributes to the overall growth. My point here is that your "fewer customer acquisitions" are merely PROPORTIONAL (at least at this time). In the context of developed markets, I completely agree with your point. That was the reason for the following comment: "Since this pattern would affect all smartphone players in the US market, it is unlikely to affect market share, but it would have a major impact on absolute sales & growth figures." However, in emerging economies, we aren't really there yet. So the challenge is still in acquiring new customers and more importantly, acquiring more new customers than your competition. This is where Apple's in a bit of a struggle (depending on who you categorize as competition - right now I don't consider Nokia to be in this boat). Until Apple is able to make iPhones affordable to the average Chinese or Indian consumer (as they are for the average American or European consumer) they still face considerable risk.